And so, what happened was the rates of transmission did go down after this vaccine was really up and running, the attenuated vaccine, and there were high amounts of uptake throughout the school-age children. And by 1981, the reported cases of measles had dramatically dropped and everybody was celebrating and thought that we had really finally done it, never mind the fact that in the beginning we were told it was going to be one shot and eradication would happen by 1967. Well, that turned out to be a total joke. So, statisticians can rightly call this 1981 period a honeymoon period because it actually ended quite abruptly, and throughout the ’80s, we started to see thousands and thousands and tens of thousands of cases per year back in the United States. And then the second shot was added, and a lot of people think that second shot was added as a booster, but, in fact, it’s well documented, by some of the most prominent vaccinologists today, and in the past, that that second shot was added in order to mop up the cases of people who didn’t respond at all to the first shot. So, that was the intention of that second shot; it wasn’t supposed to be a booster because it was known that there was primary vaccine failure, which was not uncommon at all, and we also now know that there’s secondary vaccine failure meaning that in a period of perhaps 1-10 years, there’s significant waning of immunity that’s induced by this vaccine. Jonathan Landsman: Wow, this is incredible information, Dr. Humphries. And another thing, too, that I would like to highlight – I’m sure you shake your head at the same thing, as well – in terms of the payouts, we’re talking about people who get injured by all sorts of vaccines, in particular, large amounts of money are mostly paid out because of the flu vaccine. We’re talking, literally, billions of dollars since its invention of this payout for injured people, which was in the mid-’80s, but yet, we keep hearing the same thing – vaccines are safe and effective – and they never mention this court system that they created, which was designed not to give out money to people who get injured for all sorts of reasons, and they still approved billions of dollars in payouts for those that got injured from vaccines. I’m sorry, something like that tells me right away that it is not completely safe and effective, these vaccines, at all. 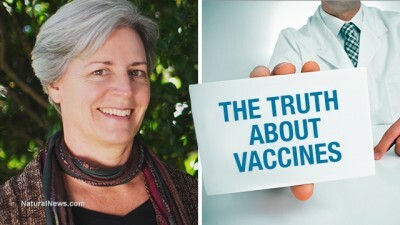 Dr. Suzanne Humphries: That’s absolutely right, and when you follow the rabbit trail, that’s where you will end up, and that’s why this orchestrated attack on parents, on doctors, on all the anti-vaccine people, even on people like Dr. Dears and Mark Blaxill, who aren’t even anti-vaccine, but are just saying, ‘hey, we need to take a look at this because there seems to be a relationship between vaccines and diseases and vaccines and autism. And what’s really happening is, in my opinion, at the center of this, is the Pennsylvania drug company, as you said, called Merck, which is the manufacturer of the MMR2 vaccine, and Gardasil, and Vioxx, and without a doubt, Merck is keeping the Senate political wheels well-greased, as well as making sure that there are significant news blackouts. Notice – have you seen anything about the whistle-blowers anywhere on CNN, anywhere on any news outlet? No, you haven’t, and it’s notable that not one mainstream media outlet covered the fact that in November last year, a judge threw out every single spurious argument that Merck’s lawyers made to have the MMR whistle-blowers case systematically thrown out of court. Doctors currently have a lot of pressure on them to do what the vaccine gods tell them to do. Paul Offit is now going around to different medical schools and coaching them how to coach their doctors to persuade their patients to vaccinate. He’s advocating a one-time warning for doctors to kick patients out of the office. So, what does that do? If doctors who disagree with Offit are de-licensed, then where are parents going to go? Parents are tossed out of his wife’s practice, as he says, and they have nowhere to go. So, Offit hypocritically will put those parents in a position where if their children get sick with anything, they have nowhere safe to go. If they end up in a hospital, they have to put up with such venom spat on them, like the likes of Offit, and yes, that happens, and I have some recordings of parents who that has happened to. So, what Offit is doing, actually, is he’s alienating the vaccine refusers with bullying and with absolute crap science and then trying to take away all their alternatives; natural supplements, homeopathy, alternative practitioners, both MDs and DOs, and any practitioners who are against vaccines. So, he’s really got people up against a wall. And I don’t know if you noticed this, but recently, Mayo Clinic partnered with Google to completely change the way health information comes up on Google searches, and the reason they say is because they want to get this quack science out of the way, the pseudo-science out of the way, and deal with the vaccine dispensers.